Apple factories in China will continue to be scrutinized despite a monologist's admission that he fabricated some of his reports on worker conditions there. That kind of attention comes with the territory for the wildly successful consumer electronics maker. But the episode also shows the dangers of when you hit too high and miss. 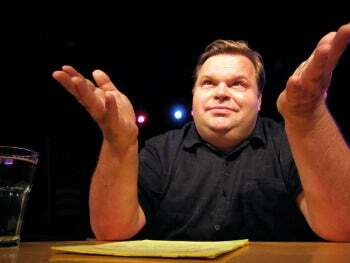 For Mike Daisey, an author and actor known for his full-length monologues, that's painfully clear. Daisey, who said he was an eyewitness to poor worker conditions at factories operated by Foxconn in China, admits that some of his claims were untrue. As a result, the radio program This American Life has retracted a massively popular episode called "Mr. Daisey and the Apple Factory" that aired on January 6. The New York Times has also removed a paragraph from an opinion piece Daisey authored last year. The lies were unearthed after Shanghai-based Marketplace reporter Rob Schmitz felt some of the things Daisey had said didn’t ring true. Schmitz located the Chinese translator Daisey had used and asked her about the people Daisey actually spoke with during a visit to Shenzhen in which he claims to have seen Foxconn guards wielding guns, overstuffed factory dorm rooms, and underage workers. Daisey also had said he met workers who were poisoned by the neurotoxin N-Hexane while assembling iPhones. The translator said she saw none of these things while working for Daisey. Schmitz and This American Life host Ira Glass then confronted Daisey in an interview about the discrepancies between the translator's account of Daisey’s trip to Shenzhen and his own. During the interview, Daisey admitted to not actually talking to anyone poisoned with hexane. "I met workers in, um, Hong Kong, going to Apple protests who had not been poisoned by hexane but had known people who had been, and it was a constant conversation among those workers," Daisey said. Daisey also admitted to taking “shortcuts” in his work and apologized to Glass. "My mistake, the mistake I truly regret, is that I had it on your show as journalism. And it’s not journalism. It’s theater." As for the New York Times edit, a story Daisey wrote titled "Against Nostalgia" referred to an encounter he supposedly had with a man whose hand had been mangled manufacturing iPads. The Times removed the reference now that Daisey has come clean and admitted he never actually met such a person. Apple was hit with a lot of bad press earlier this year surrounding worker conditions in its supply chain factories operated by Foxconn in China. The issue is not new. For instance, in January, PCWorld covered a story about how 150 Foxconn workers staged a protest threatening to jump off a building if the company did not meet their compensation demands. Also troubling: More than a dozen workers have attempted -- and succeeded at -- suicide by jumping from Foxconn buildings. There is another side to the story, though. ABC’s Nightline aired a report in February in which TV correspondent Bill Weir took cameras inside Foxconn and showed that young workers there mostly suffer from boredom more than anything else. In the meantime, the Fair Labor Association has been conducting special voluntary audits of Apple's final assembly suppliers, including Foxconn factories in Shenzhen and Chengdu at Apple's request. The FLA has not yet released its findings. Follow Christina on Twitter and Google+ for even more tech news and commentary and follow Today@PCWorld on Twitter, too.